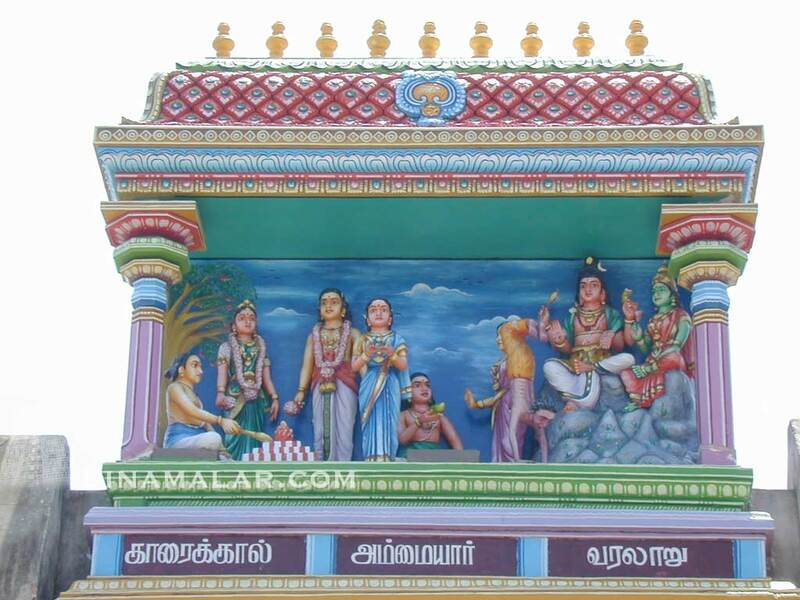 Of the 63 saiva Nayanmars who spread Bhakthi culture in South India ,three were women.Punithavathi (Karaikal ammaiar),Mangaiyarkarasi(Queen of Pandia King from Madurai ) &Thilagavathi ammaiar - elder sister of Thiunavukkarasar orஅப்பர். Punithavathi lived during 6th century AC.She was born in a rich business family in coastal town of Karaikkal .From her childhood on wards she was a great devotee of God Shiva.She was married to a trader named Paramadattan of a near by coastal town Nagapattinam.She was a well cultured housewife ,looked after her husband.She also used to offer free food to devotees of Shiva.One day his husband sent two mango fruits to Punithavathi, which he got from his friend.She kept one mango for her husband & gave another one to a Shiva devotee.During lunch time,she served the mango fruit to her husband.He asked for another one.Now Punithavathi went inside Pooja room & prayed to Shiva to save her from the delicate situation.A mango fruit appeared in her hand.A relieved Punithavathi gave it to her husband.After eating it, he felt that the mango was most delicious & asked whether it was sent by him.Now Punithavathi, told that she already gave one to devotee, the second one consumed by him where as the third one she received from God Shiva Himself.Unable to believe this , he asked for another mango .Anther mango appeared in her hand.Now Paramadattan realised that she was a true devotee of God Shiva & afraid of living with her .He switched over to Madurai & married another woman.When she learnt that, she was upset so much.She was young then.She prayed to God Shiva to give her a devilish attire which was granted.She wished to visit Mount Kailash.She began to walk upside down & began to climb as she considered Mount Kailash as Shiva's holi abode. 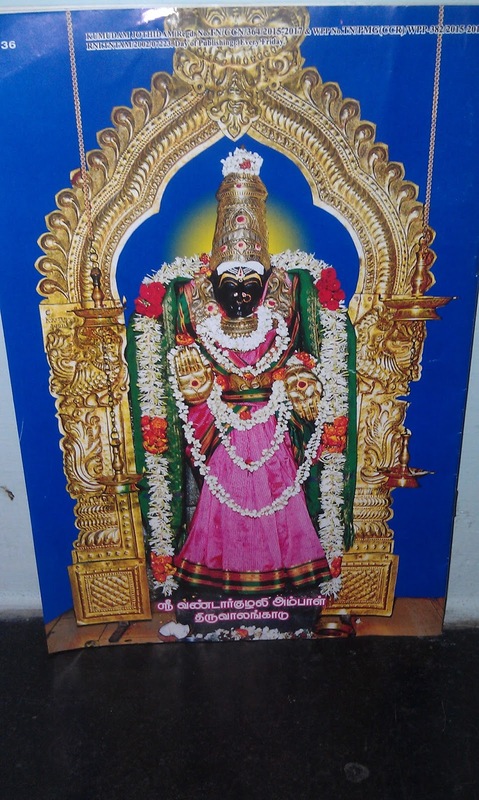 Seeing her devotion to Him ,Lord Shiva called her,"mother".She prayed to God Shiva that she wished to witness His aanantha thandavam - Cosmic dance & to remain by the side of his foot ever.Shiva accepted her request & directed her to reach Thiruvalangadu where he has been performing cosmic dance watched by Karaikkal ammaiar even today.She has composed devotional songs God Shiva which is included in "Panniru Thirumurai"பன்னிரு திருமுறை . 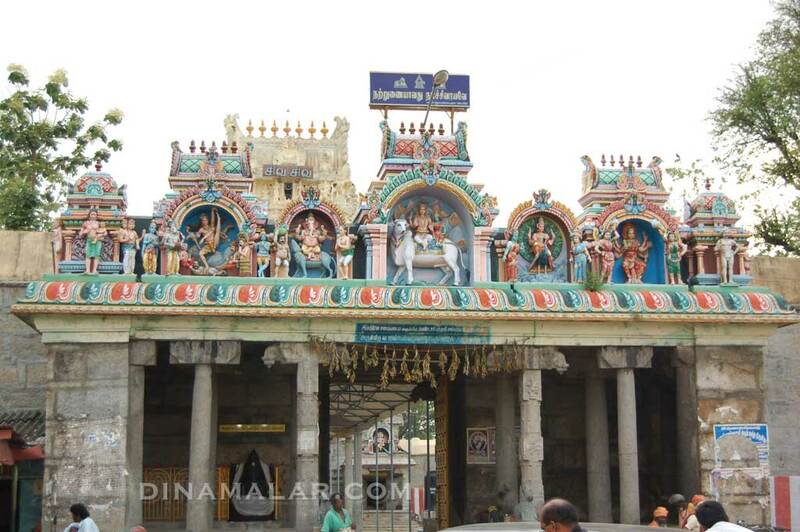 A temple is dedicated to her in Karaikkal where mango fruits are showered during June - July(மாம்பழத்திருவிழா ).Thiruvalangadu is in Tiruttani taluk of Thiruvallur district & located in between Arakkonam - Chennai Railway.It is one of the "Dancing Saba" (dancing place) of God Nataraja. (பஞ்ச சபைகள்- ரத்ன சபை ).You may be well aware of Chidambaram which is called Golden Saba - பொன்னம்பலம் .